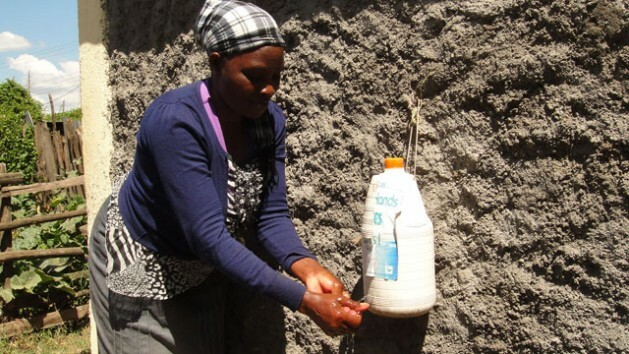 NAKURU, Kenya, Apr 20 2016 (IPS) - Lydia Abuya, a tenant living in the Kaptembwa informal settlement west of Nakuru town, leaves one of the six on-plot toilets. She returns with a pail of water to splash away the waste. This kind of a toilet, in this densely populated low income area, is now saving hundreds of residents from the spread of diarrhoea and cholera, very common with presence of a pit latrine which was earlier available for her use. Let alone the suffocating odour, overflowing faeces and fear of children playing in the filth. But this pour flush toilet, as it is called, has given Abuya and 15 other tenants in the plot a new meaning to their lifestyle. Soon as she finishes pouring the water, she heads to a five-liter jerrican hung outside the wall of the toilets, pulls off a stick covering a hole made on the lower side of the container and lets out water to wash her hands. “This is our sink. Nowadays, it is our routine to wash our hands once we leave the toilet. Earlier we ran away because of the strong smell that made you hold your breath while inside the toilet,” she told IPS while shying away from the camera. Her landlady Hildah Kwamboka who has lived in the area since 1990 does a daily inspection of the facilities to ensure their cleanliness. She says the improved toilets have brought forth a change in her compound. “A lot has changed since they (tenants) started using these new facilities late last year. You cannot see any faeces anywhere in this compound. The pit latrines were unclean which encouraged some to soil the open spaces within the compound, “says Kwamboka who is now a hygiene champion. In the East African nation, county governments are now responsible for provision of sanitation services formerly administered by local authorities. This follows transfer of functions under devolved governance enacted in 2010 Constitution. According to Nakuru county public health regulations, pit latrines are not permitted in the urban set up. However, they make up 63 per cent of sanitation facilities in Kaptembwa and its neighbouring informal settlement — Rhonda. Pour flush toilets connected to septic tanks or sewer lines are allowed but in these areas pit latrines put up with planks and mud is a common sight that is slowly fading away. Worse still is the fact that more than 10 households equivalent to users exceeding 40 people share one latrine as indicated in Practical Action’s 2012 baseline findings. This is against the UN habitat recommendations of one toilet for 20 people or four households. While Kwamboka has made a leap in bringing her tenants closer to achieving the sixth sustainable development goal on accessing and enjoying better sanitation services, her efforts are as a result of a partnership between Practical Action,Umande Trust and Nakuru county’s department of health. She is a beneficiary of a Comic Relief-funded project themed ‘realising the right to total sanitation’ which the partners implemented in Kaptembwa and Rhonda — highly dense low income settlements — where approximately 140,000 people live. The project utilised an innovative approach — community led total sanitation — which involves mobilising communities to identify their sanitation problems and address them using own local resources. With the project, the partners sought to eradicate all urban forms of open defecation, promote better solid waste management activities and proper hygiene behavior. Achieving these involved educating the locals on maintaining a clean environment and observing high hygienic standards. Also, facilitating landlords to construct improved toilets and provide innovative hand washing solutions such as the water spitting jerrican hang on the wall of Kwamboka’s toilets. “We introduced a loan facility in which we linked landlords to K-Rep bank from which they borrowed loans at 7.5 per cent interest. And at the end of the project 17 of them had borrowed a sum of up to Sh 4.8 million (US $ 47,300) constructing 43 new improved sanitation units,” said Patrick Mwanzia, the senior project officer for Practical Action’s urban water sanitation and hygiene and waste programme. Mwanzia, however, says they entered into a memorandum of understanding with the lending institution to continue offering land owners tailor-made loans to specifically meet costs of constructing or upgrading sanitation facilities. Between March 2012 and January 2015, the partners sensitised more than 135,000 people who have now become agents of change for the provision of sanitation services and adherence to high hygienic standards. “There was a positive reception from the communities which resulted to construction of 2,204 sanitation facilities with 58,260 people within the plots directly benefitting,” said Mwanzia. According to United Nations Children’s Emergency Fund, only 15 per cent of the 9,126 villages in Kenya had been targeted to eradicate open defecation by 2014.This means thousands of rural and urban residents live with exposure to open space faecal disposal. “I can now stand outside with a plate of food and eat peacefully. There is no stench or disturbance of flies. Life is more comfortable and bearable, “notes Hesbon Nyambare, a beneficiary of the project. He is in charge of 35 rental houses and his house is adjacent to six newly built pour flush toilets which cost him Sh 100,000 (US$985). He completed the construction in mid-2015. While deputy Nakuru county public health officer, Daniel Mwangi, acknowledges the existing gaps in observing recommendable levels of sanitation in the informal settlements, he says enlightening locals on sanitation and hygiene is key since it unlocks their power to engage in proper sanitary activities. “We have seen tremendous changes following the implementation of the project. Defecation in areas where it was so rampant has declined significantly,” he observes. He adds that: “There is a challenge of landlords ignoring rules and regulations but we are committed to keeping them within the laws. The law has to be enforced”. Even so, the locals reversing their habits remain a concern that the county government hopes to address through the hygiene champions trained under the project.